During half term we took a trip to Longleat Safari Park and drove through the monkey enclosure. 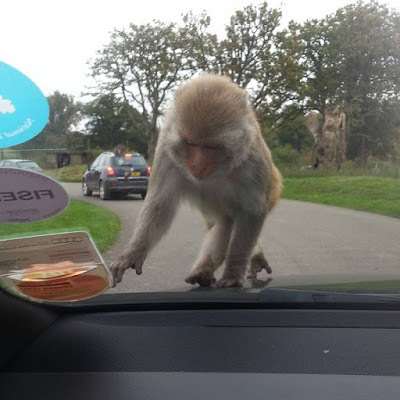 Thankfully our car survived intact but I had been slightly worried given that we had read The Great Ape Escape by Fiona Manlove the night before. In The Great Ape Escape, a family of apes who live in a safari park start to plot their own escape from the park by stealing items from the visitors to the park. It starts with small car parts - a wiper, a wing mirror. Lead by the gang leader, Banana Bill, the things that mysteriously disappear from people's cars seem to get bigger and bolder. Eventually the family have enough parts to create an escape vehicle of their own! Lara and Holly both enjoyed the story and thought it was funny when the other animals in the zoo started to notice weird goings on. Sadly though, I found the story really hard to read to them - it didn't flow nicely and seemed to immediately launch in with the names of monkey characters who hadn't been fully introduced. The book works a lot better when it is you reading it to yourself and referring to the illustrations - Lara and Holly kept asking me questions about who was who. As I read it to them and showed them the pages, they missed some of the detail about what was being stolen from the cars as sometimes it wasn't explicitly mentioned in the text but referred to in context by one of the other characters. 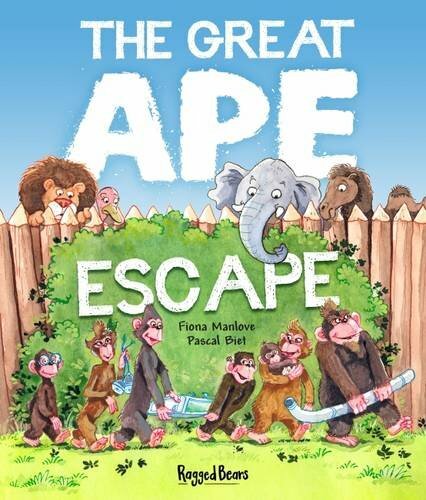 The Great Ape Escape has been a memorable read. It was quite a topical story for us but I can't picture the girls regularly going back to this book.